One of my major beefs with black/thrash is that some bands tend to take the easy way and make it sound like terribly simplistic bedroom black metal with a few thrashy riffs and d-beats strewn around here and there. All in moderation, really - It's not like Desaster is the most technically advanced band ever, and Deströyer 666 often follow the exact same patterns in songwriting. But the difference is that those two bands do it with moderation; Their music may not be the most varied of sorts and may not have crystal clear production, but they make it work and make up for any shortcomings in brilliant songwriting. A band that has chosen to take the high road is Australia's black/thrash quintet Malichor. The Lovecraft-themed band don't overdo anything. It's straight to the core black and thrash metal in equal amounts, and it works astonishingly well for them. Their recipe for disaster consists of iconic, catchy riffs over a high tempo rhythm section made up of a thrashy and audible bass aswell as drums presenting varying degrees of blasting. The vocals too are greatly varied, ranging from animalistically roaring growls to the more classic, rasping black metal vocals. Though melody is seldom part of the equation in black/thrash metal, Malichor has found room for a rather melodic riff in the track Jackal's Spell. I was worried that it would break the malicious atmosphere that the band had already by the second track created on the EP, but I found that it added another element of mysticism to the music that fits Malichor's Lovecraftian style very well. It's obvious that Malichor take a lot of influences from the 80's, both in their stage names and their music. But to me "Lurkers in the Crypt" is so much more than blatant 80's worship. It's not so much that they're revolutionizing the genre, because let's face it, they aren't. But in later years it seems all bands are either tighty than a nun with crystal clear production, or the directly opposite, making Hellhammer sound like the afforementioned. Malichor found a great median between the two. Their half-sloppy playing provides the EP with some much appreciated dynamic, and I found the EP to be very well written in general. Of the four tracks on the EP there aren't really any tracks weaker than the others, and all the tracks provide the release with it's own element to make it a wholesome experience. "Jackal's Spell" provides the more melodic elements aswell as a pumping headbanging piece, even if melody is something seldom seen in relation to black/thrash, and the iconic "Demonic Power of Infinity" is probably the fastest of the four tracks aswell as being the most unrelenting. It reminds me of some Norwegian black metal which combined with their hints towards Deströyer 666's memorable choruses and satanic solos makes it a breathtaking experience. The music in itself isn't very lovecraftian and doesn't invoke visions of the great old ones or anything like that, but the cover reminds me of a certain short story by H.P. Lovecraft called "The Statement of Randolph Carter", in which the main character, Randolph Carter, describes how he and one of his associates visits an old graveyard and how his partner goes into a crypt only to suffer a horrible death to some unspeakable, unnamable horror. The whole ordeal is quite vividly described and as such, to me, goes very well hand in hand with this devilish EP. 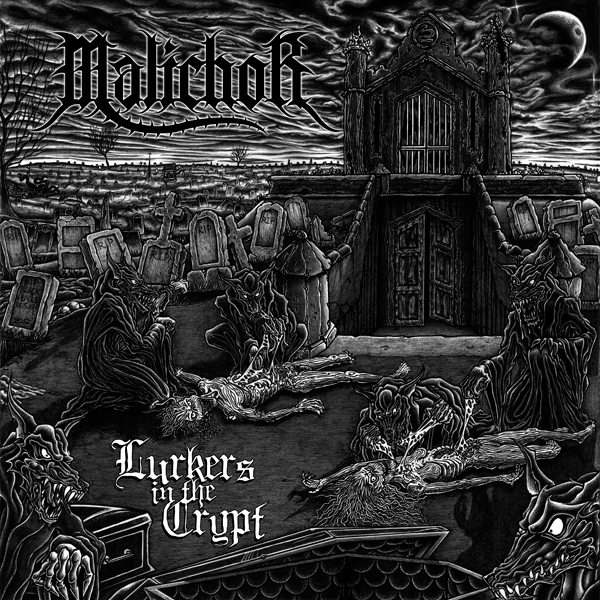 All in all Malichor show great potential on "Lurkers in the Crypt". Their sense for songwriting and ear for riffs is astonishing. 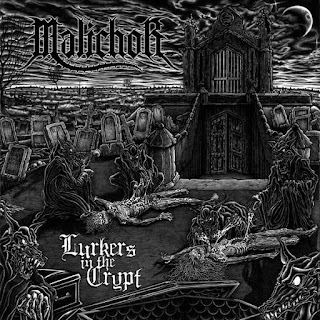 Following in the wake of a new wave of satanic speed metal they measure up to some of the genres forefathers in terms of songwriting, and I found Malichor to be just as vigorous, profane and unrelenting as some of the genre's revered progenitors. 9/10 guitars. Poland has had a good run of metalbands that fuse the raw brutality of death metal, the faster elements of thrash metal and the evil that drips from black metal. Like Norway produces black metal bands, Poland has in the last few years produced many great bands, including Behemoth, Hate and Vader that have probably been more or less responsible for creating this new wave of blackened death metal. I've had the pleasure of reviewing many bands like Pandemonium, Centurion, Embrional, Sphere, Stillborn and Empatic, and like these bands Hell United have sought a sound that combines the collected evils of black and death metal with some serious nods towards thrashy tendencies. 9 songs strong, Aura Damage - the second full length album from Hell United - perfectly showcases a great understanding of how to create high-tempo metal riddled with tremolo riffing and blasting drums. Songs like the sinister "Deathlike Cold", the equally fast-paced "Apostle of Plague" and the tenebrous closing track "Totality of I" are what make Aura Damage an album worth checking out if you are into the bands mentioned earlier. The Polish quartet show great craftsmanship in the terms of writing metal, but it's not all fun and games. While the 2012 album shows great promise and provides great consistency in genuinely good songwriting, I found most of the album to border on a run of the mill type of stuff. True, the album makes for a good listen and consists of mostly pretty good songs, but in the end it all flows together into an immemorable blob, and only the three songs I mentioned earlier are really memorable. Hell United's Aura Damage is an album that I won't deny has a good vibe to it. It yearns to be listened to, and the energy the album perveys is something speciel. But I gotta be honest and say that it isn't an album I would put on for my own listening pleasure. I wouldn't put it on for anything other than background music for when I do other stuff. But this purpose it serves greatly in that it has a great, oppressive atmosphere, good dynamic song structures and pretty good riffs. But what makes it weak as a piece in its entirity it's the fact that most of the songs sort of blend together. But even so I feel I must give Aura Damage by Hell United 7/10 guitars because of the sheer force that the work conveys.